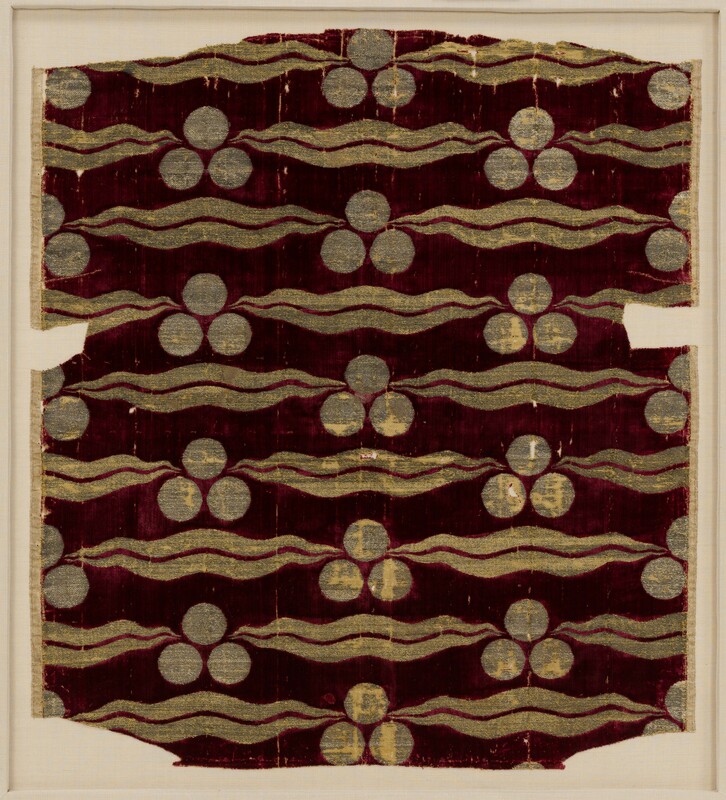 This early example of chintamani silk velvet incorporates the triangular formation of three circles alternating with two wavy bands. The pile in these luxurious textiles is created by the warp threads, which are looped during the weaving process and later sheared to create the plush surface. Polychromatic designs were created by alternating two or more warps in contrasting colors, and brocaded with metal-wrapped weft threads creating the "voided" ground in the design. Three Textile Fragments with Ogival Patterns (nos. 52.20.22, 44.41.2 and 49.32.79)Silk velvets woven in Bursa, the Ottoman Empire’s first major capital city and its center for the trade in Iranian and domestic raw silk as well as for luxury silk weaving, reached their zenith in quality by the later fifteenth century. This small fragment, probably originally from the back of a garment, exhibits a dense silk velvet pile dyed dark purple-red with expensive insect-based dye. The areas without pile were originally densely brocaded with ivory silk yarns wrapped in very thin strips of silver, most of which has over time tarnished to a dark gray. Early Bursa velvets were woven on looms with a standard width of about twenty-nine and one half inches (75 cm), and this loom-width example has a selvage on both sides. Other examples from this bolt are found in many museums. The pattern is known as chintamani, a Sanskrit term translatable as "auspicious jewel." In an amazing design migration, the original Buddhist artistic form—three flaming pearls set in the headdress of a bodhisattva—entered the Islamic world as early as the ninth century, where it appeared in the Abbasid pottery of Samarra in Iraq. Recognized as a good-luck symbol of great power, it appeared again quite prominently around 1400 in Timurid coinage struck in Iran and Central Asia, and by the later fifteenth century the form began to appear in almost every medium of Ottoman art, from ceramics, manuscript binding and illumination, woven textiles, and carpets to metalware, carved stone architectural decoration, leatherwork, and embroidery. The three-spot design is often referred to in Ottoman sources as benekli (spotted) or pelengi (leopardlike). Over time, the form appears to have gathered, in addition to its associations with good luck and the warding off of evil spirits, a distinctly masculine aura, probably because of its association with the spotted leopard-skin helmet and striped tiger-skin coat worn by the popular Persian epic hero Rustam. Ottoman art with this motif usually appears in the secular sphere, but by the later seventeenth century the chintamani motif was prominently used on the facade of an imperial house of prayer, the Yeni Valide Mosque, in Istanbul. 1. Among others, the Textile Museum, Washington, D.C., and the Museum of Fine Arts, Boston. 2. See Paquin, Gerard. "Cintamani." Hali, no. 64 (August 1992), pp. 104–19, 143–44. 3. Denny, Walter B. "Ottoman Turkish Textiles." Textile Museum Journal 3, no. 3 (December 1972), pp. 55–66; see also The Splendor of Turkish Weaving: An Exhibition of Silks and Carpets of the Thirteenth–Eighteenth Centuries. Exhibition, The Textile Museum, Washington, D.C. Catalogue by Louise W. Mackie. Washington, D.C., 1973, p. 21 and pl. 1. Ettinghausen, Richard. "Islamic Art." Metropolitan Museum of Art Bulletin vol. 33, no. 1 (Spring 1975). ill. p. 43 (b/w). Atasoy, Nurhan, Walter B. Denny, Louise W. Mackie, and Hulya Tezcan. IPEK: imperial Ottoman silks and velvets, edited by Julian Raby, and Alison Effeny. London: Azimuth Editions, 2001. pp. 298–99, ill. fig. 287 (b/w). Ekhtiar, Maryam, Sheila R. Canby, Navina Haidar, and Priscilla P. Soucek, ed. Masterpieces from the Department of Islamic Art in The Metropolitan Museum of Art. 1st ed. New York: The Metropolitan Museum of Art, 2011. no. 230, pp. 324-325, ill. p. 324 (color). Denny, Walter B. How to Read Islamic Carpets. New Haven and London: The Metropolitan Museum of Art, 2014. p. 123, ill. fig. 109 (color). Anatolia and the Caucasus, 1400-1600 A.D.